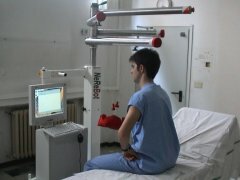 NeReBot (NEuro REhabilitation roBOT) is a cable-suspended device for upper limb rehabilitation of post-stroke patients. Three nylon wires convert the rotating motion of three d.c. motors into a 3D trajectory of patient's arm. A real-time software performs both on-line point by point acquisition and repetition of the 3D trajectory obtained by interpolating the acquired points. 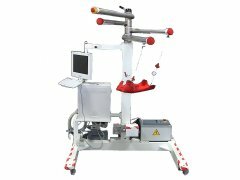 This device was designed to target post-stroke patients in a very early stage (a few days after the stroke), and can be operated both at bed side and with wheel-chaired patients. A first pilot study on 30 patients gave positive clinical relsults at follow-up. For more information on neurorehabilitation robotics research visit www.rehabrobotics.it.